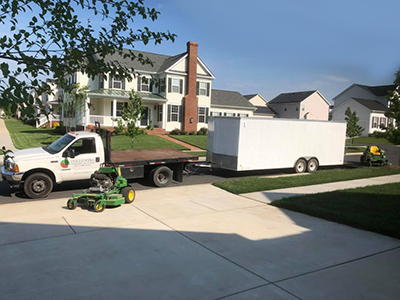 Collentro Landscaping provides landscape maintenance in Southern MD, St Marys County and Calvert County. Landscape maintenance is much more than mowing your area. Landscape maintenance in Southern MD is knowing the proper way to maintain a landscape. There are right and wrong ways to properly maintain, fertilize and water your landscape. Proper fertilization in late February or early march is key to a lush green lawn in the spring and summer months, followed by proper watering and aeration to keep roots healthy. We can also help with proper fertilization and spray for your fruit trees to help the fruit thrive for a healthy harvest. Keeping your lawn free and clear of harmful insects such as grubs is one of our specialties. We can detect these defects and notify you before these insects take over your yard. Keeping your lawn free and clear of harmful insects, weeds, properly fertilized and watered will allow for a lawn to be proud of and that is what we strive for. Once fall arrives we are equipment to help you with lawn detaching and fertilization, to prepare for the cooler months, leaf removal, yard cleanup and detail visits. Once winter bares its coat of white snow we are fully equipped with trucks and skid steers to clear your driveways or businesses to keep your access clear and safe. 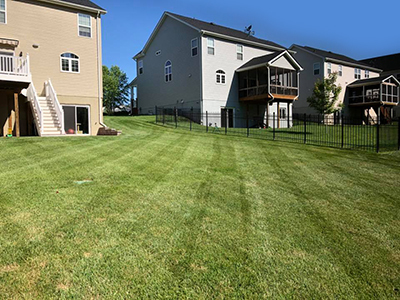 Our lawn mowing care service includes lawn mowing the entire yard (or business property), line trimming (weed eating) around all flower beds, trees, posts, fencing, etc. We edge all sidewalks, patios and driveways and clean up all trimmings from the hard surfaces around your home or office. We use mulching mowers which is much better for the lawn. We recommend frequent lawn mowing to help a lawn resist weeds, insects and disease. Infrequent mowing causes too much grass to be removed at one time and produces a lawn that looks thin, spotty or burned. Normally we never cut more than one-third of the length of your grass at a time. Collentro mulches your clippings to return valuable nutrients to your lawn. For example, the nitrogen in grass clippings can provide about one-third of the yearly nitrogen needs of a lawn. Bagging lawn clippings eliminates these valuable nutrients from your lawn. We sharpen our mower blades often so we can provide the supreme cleanest cut possible to eliminate jagged or uneven cutting making your lawn more vulnerable to disease. To reduce the frequency of flower bed maintenance and weeding we recommend installing mulch in all flower beds often. Mulch helps retain the moisture needed to maintain healthy shrubs. Note: Too much mulch around certain flower types could lead to root rot and fungus. We can help you determine how much mulch is needed to cover your flower beds. We are well trained in the proper trimming of all types of bushes, shrubs and hedges. Collentro Landscaping offers a variety of services to revitalize or refurbish your lawn. To accomplish this we offer core aeration & overseeding, power seeding, and sodding. Aeration is simply punching holes into the turf to allow moisture, oxygen, and nutrients to penetrate the soil. Aeration reduces soil compaction and makes a lawn less susceptible to weeds, insects, drought, and disease. Aeration combined with overseeding is an outstanding way for an established lawn to relieve compaction and improve its density. We recommend aeration & overseeding once per season to all established lawns. We use top quality seed that is free of injurious weeds. For immediate results, without the wait for grass seed germination, we offer turf sodding. Sodding is the process of applying strips of turfgrass to prepared soil, to create an "instant" mature lawn. Sodding can be done at anytime of the year to instantly transform the appearance of your home or business landscape. We use only golf course grade quality sod. Beware of contractors that use cheap sod full of injurious weeds. This service involves picking up and removing all leaves in the yard, on the business property and flower beds. Excess leaves can restrict sunlight, nutrients and water from reaching your lawn causing disease, insects and overall stress. Stop spending your free time raking leaves. Let us take care of those annoying leaves for you. We generally recommend this service be scheduled in the spring or fall. We can provide miscellaneous lawn cleanup services. This includes cleanups of conservation areas, trimming up trees, replacing dead or unhealthy plants, or raking the lawn. St Marys County Lawn Care Landscape Maintenance, Calvert County Lawn Care Landscape Maintenance, Southern MD Lawn Care Landscape Maintenance, St Marys County Lawn Cutting, Calvert County Lawn Cutting, Southern MD Lawn Care Cutting, St Marys County Lawn Cleanups, Calvert County Lawn Cleanups, Southern MD Lawn Cleanups. Leaf Removal St Marys County, Calvert County Leaf Removal, Snow Removal St Marys County, Snow Removal Calvert County.